Living in Vermont, we are woefully late to most major trends. Some may consider this is a positive thing, as we’re protected from consumerist whims, but I, as a futurist by trade and an early adopter by choice, feel left out from major trends that pop up on the streets of New York and in my Discover page on Instagram. I have to get on a plane to participate in the latest meal-in-a-bowl craze, and scour the deep links of the internet to find a trendy shoe at a manageable price point. We don’t have many retail options up here, even in the “city” of Burlington, and we only get to participate in a major trend if it stands the test of time. Trends are interesting beasts. the cycle from niche > aspirational > accessible > oversaturated is faster every year, and since it’s my job to seek out rising brands and products for work, I find myself lusting over niche products but having a hard time accessing them up here. I find myself wanting things as they shift from niche to aspirational, but can’t source a site with it in stock fast enough. Then an item moves into the accessible and oversaturated phases way too fast, and suddenly it’s on to the next thing. Or so the internet tells me. About two years ago, I had my first experience with the intoxicating woody notes of Le Labo perfume. I was entranced by it, initially thrown off. In Vermont, you get called out for wearing overt fragrance. If you don’t smell like a combination of maple sap, Dr Bronner’s, and the great outdoors, it makes you different, a little uppity, and certainly vain. I’m perfectly fine being labeled any of those things, but the Le Labo fragrances are so pervasive, I knew that I wasn’t ready in to what I considered my first very adult fragrance decision. I couldn’t shake the idea of it, though, no matter how hard I tried. Le Labo started popping up in Top Shelves and Instagram posts everywhere I looked. Walking down the streets of Soho, I would be hit by frequent waves of something I later identified as Santal 33. I loved it. it smelled so good, so expensive, and so different from my every day. I settled on Glossier You as my daily perfume when it launched, mostly because of the comparisons many made to it as a much more subtle cousin of a Le Labo fragrance. I picked up the Maison Louis Marie No. 04 Bois de Balincourt candle for the same reason (they were burning it in the Outdoor Voices Austin flagship store when I visited and immediately needed it). 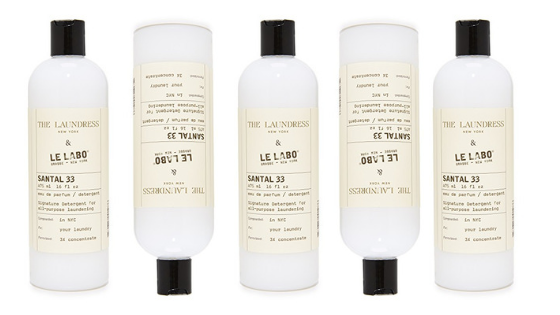 Now, Le Labo Santal 33 has been declared basic. It’s hit mass saturation, and has lost its cult appeal the more popular it became. I even caught whiffs of it at my boyfriend’s company party. I was impressed and immediately wanted to be that wearer’s friend, mostly because it meant she and I had common scent preferences all the way up here in the fragrance-free Green Mountain State. Since I yearned for it for so long, I’m not quite ready to let my dreams fade and say goodbye to it, even if I should be looking for the next thing. It’s how I feel about Ugg boots, or AirPods. The heart wants what the heart wants. As a compromise to myself, I think I’ll purchase it in a slightly more unique format: as a laundry detergent. Spending $45 on a Tide-alternative isn’t basic, right? And maybe that’ll give me the push that I need to do laundry a little more often in 2019. With Santal 33 waiting for me in our linen closet, I can’t see myself waiting for my hamper to overflow too aggressively before solving the dilemma of dirty clothes with one chic bottle of detergent. I've grown very fond of Jen Atkin's hair care collection, Ouai, because of its sophisticated musky-floral fragrances and its promises to kick your hair up to Kardashian level with just a few spritzes. I've even gone so far in the past as to set up Sephora alerts for new launches for any product that would be mildly compatible with my wavy-ish hair that refuses to hold a curl. Her Memory Mist actually helps me accomplish something of a beach wave! The brand's newest launch isn't something I could actually use - I have a cat who hates water almost as much as she hates vacuums. The brand just launched a Pet Shampoo that will elevate your four-legged friend's routine and give them a "sheer and airy floral/musk" scent, thanks to notes of Italian lemon, Turkish rose, jasmine sambac, iris, lily, and white musk. 15% of sales go to the Vanderpump Dog Foundation, so even if your pop isn't striving for dog-fluencer status, you shouldn't feel too guilty about paying $29 for some doggy soap. She's hinted at having other creative projects in the works beyond her IG pages, and her first one was released this week. A simple, yet completely on-brand custom t-shirt. I'm thinking this will bring together true @gelcream fans the same way that Glossier's grey sweatshirts did. Even though it's a little pricey ($59), I love supporting bloggers and other creatives when they make the leap from Instagram posts to a finished product. Plus making product in small volumes is incredibly expensive! And the design is so cool AND comfortable - my only two real qualifiers when shopping for myself. I already bought mine. I'm a girl who owns zero pairs of spindly high heels (wedges and sturdy stacked heels are my fo-to, preferably from Madewell), has too many pairs of workout leggings, and air dries my hair 99.9% of the time. I live for comfort and thrive in low-effort environments. I blame it on too many years of living in Vermont, land of Birkenstocks and actual no-makeup looks (my Birkenstocks are rose gold, though, and my overflowing makeup bag is proof of my Sephora VIB status, so it's all relative, I suppose). This expected level of comfort extends to all aspects of my wardrobe, including beachwear. We may have approximately 8 months of winter here (a slight exageration, but only a slight one), but the second that it gets above 70 degrees, you'll find me down at the lake, wearing a hat, absorbing as much vitamin D as I can on my exposed limbs. 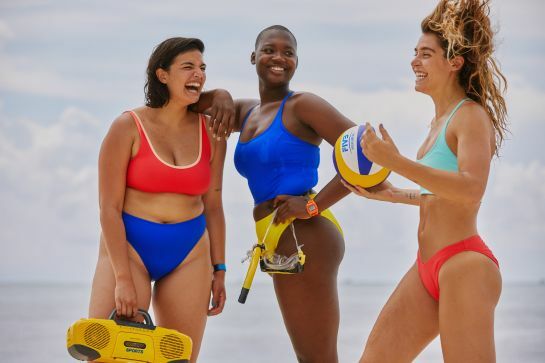 The just-launched collection of swimwear from Outdoor Voices is perfect for those long afternoon of sipping Zero Gravity beers by Lake Champlain. The tops and bottoms promise to stay put during an impromptu game of frisbee, and you won't flash anyone while trying to get situated in a fruit-themed floatie. And, the available colors all compliment any level of tan! I've been a fan of this brand for years, and their new collections do not disappoint. This one launches just as I'm starting to get bored with all of the other swimsuits that I have in my dresser for the season. Serendipitous, or just really good planning on their part?